Internet radios play radio programs that are streamed over the internet, and deliver them with near CD quality audio. The radios need a moderately fast internet connection. They can be plugged into your network or connected wirelessly. When you have an internet radio set to connect wirelessly, you have the freedom to move the radio anywhere you would like to listen, even outdoors. Most people get an internet radio so they can listen to their favorite stations with perfect clarity. Often, they are astounded by all the programs they are able to receive. We’re sure you will become a loyal listener to The Sword, but you well may find other stations you’ll enjoy at times. You can search through sports, talk, news, comedy, and music stations from around the world. Just about any genre you can think of is available. You can even listen to niche stations, such as “All Elvis All the Time”. 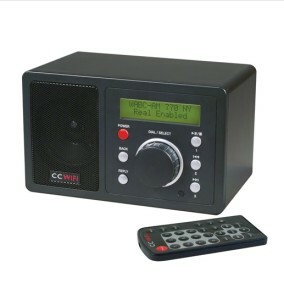 You can easily find internet radios online to purchase. But, please take care to verify that the radio you choose uses Reciva or TuneIn. We may be able to register with other providers in the future, but for now you will have to connect through one of these two. Our radio station uses equipment from C. Crane to monitor the Emergency Alert System. The company has been selling high quality radios for 30 years. They have a few models of internet radios, which all use Reciva or TuneIn. Their website is a good place to learn more about internet radios. I would encourage you to poke around their website and read all you can. You can view the specifications, read reviews, watch videos about the radios, and even download their user manuals. Would You Like to Bless Our Ministry and Get a FREE Internet Radio? One goal of our board of directors is to make it as convenient as possible for our listeners over the internet. Listening on a computer is great, but its not mobile. Our mobile apps are terrific for those who enjoy steaming audio on their smart devices. But, many listeners would be much more comfortable with a conventional radio. Once set up, internet radios work very much like traditional radios. Thanks to a special donor, and a generous discount from C. Crane, we are able to offer a free CC WiFi Internet Radio to listeners with qualifying pledges. Those who commit to donate a minimum of $25 per month for one year, or $15 per month for two years, will receive a free internet radio. Email manager@kswzlp.com for more information. Reciva and TuneIn both offer enhanced programming for a subscription price. But, it costs nothing to listen to the vast majority of the programs they stream. The Sword is absolutely free. To search for our station on an internet radio you can search for “SWORD” or “KSWZLP”.